Get Ready for an Early Holiday Present! The Department of Commerce announced today that it would uphold the California Coastal Commission's decision! The egregious project to build a toll road through San Onofre State Beach is officially illegal under state and Federal law! In a release issued from the Department of Commerce, they "determined that there is at least one reasonable alternative to the project and that the project is not necessary in the interest of national security. While the decision is a fatal blow to the project, the fight to build the toll road is not over. We still need opponents of the toll road to continue writing letters and communicating with their local elected officials to let them know we are happy with the results and we stand behind the Department of Commerce's decision. In the coming days, we will have specific action items, but in the meantime, take some time to CELEBRATE this wonderful victory! Of course, Surfrider and our Coalition members will be planning a great celebration party, so stay tuned for that. This victory would not have been possible if it was not for the activists who showed up by the thousands at the California Coastal Commission and Secretary of Commerce hearings or wrote letters to voice their opposition to the toll road. Without a doubt, this victory belongs to the all dedicated individuals who have followed this campaign for several years. The ruling proves decision-makers listen when thousands of people speak out against ill-conceived projects. Surfrider is calling upon the TCA and Orange County elected officials to embrace alternative transportation strategies that will better address the county's traffic issues without jeopardizing our environmental, recreational and economic resources. We challenge the TCA to stop wasting money on lawyers and lobbying and to work with regional stakeholders to find better traffic solutions. Should the TCA choose to appeal the Department of Commerce's decision, the Surfrider Foundation and its coalition partners are prepared to fight that battle as well. 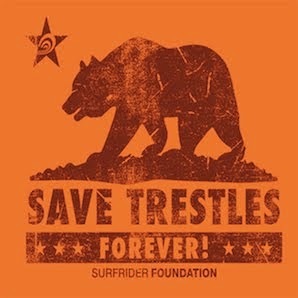 On behalf of the Surfrider Foundation thank you for your continuing support! Our flagship campaign would not be possible without! Yippieeeeee... this makes all the standing around and paying for parking worth it!!!! It even makes enduring the cat-calls from the orange-shirted laborers worth it (those laborers will make more money with any alternative than they would have with pavin' the park).. Here is a link for the Environmental Defense Fund's page to exprees your disappointment with the Greenwashed Governator/Terminator of California's wildlife. Much love, peace, and respect to the bravest of all who cherish the Earth, and the Sea. Great site and a great topic as well. I also want to share with you some good website I also want to share with you some good website - https://essay4me.org/. It`s a really cool online writing service with a very professional team, great writers and amazing support.